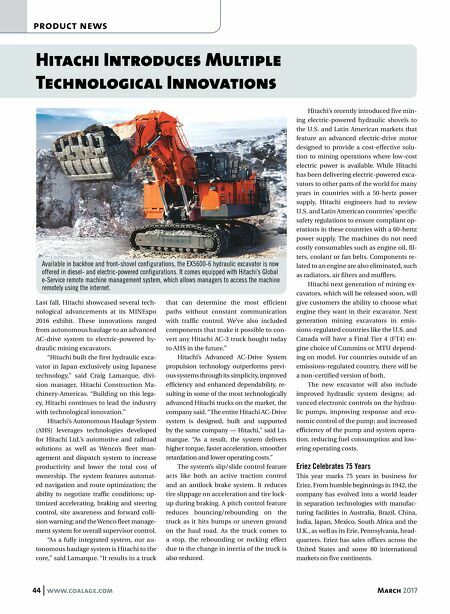 44 www.coalage.com March 2017 product news Hitachi Introduces Multiple Technological Innovations Last fall, Hitachi showcased several tech- nological advancements at its MINExpo 2016 exhibit. These innovations ranged from autonomous haulage to an advanced AC-drive system to electric-powered hy- draulic mining excavators. "Hitachi built the first hydraulic exca- vator in Japan exclusively using Japanese technology," said Craig Lamarque, divi- sion manager, Hitachi Construction Ma- chinery-Americas. "Building on this lega- cy, Hitachi continues to lead the industry with technological innovation." Hitachi's Autonomous Haulage System (AHS) leverages technologies developed for Hitachi Ltd.'s automotive and railroad solutions as well as Wenco's fleet man- agement and dispatch system to increase productivity and lower the total cost of ownership. The system features automat- ed navigation and route optimization; the ability to negotiate traffic conditions; op- timized accelerating, braking and steering control, site awareness and forward colli- sion warning; and the Wenco fleet manage- ment system for overall supervisor control. "As a fully integrated system, our au- tonomous haulage system is Hitachi to the core," said Lamarque. "It results in a truck that can determine the most efficient paths without constant communication with traffic control. We've also included components that make it possible to con- vert any Hitachi AC-3 truck bought today to AHS in the future." Hitachi's Advanced AC-Drive System propulsion technology outperforms previ- ous systems through its simplicity, improved efficiency and enhanced dependability, re- sulting in some of the most technologically advanced Hitachi trucks on the market, the company said. "The entire Hitachi AC-Drive system is designed, built and supported by the same company — Hitachi," said La- marque. 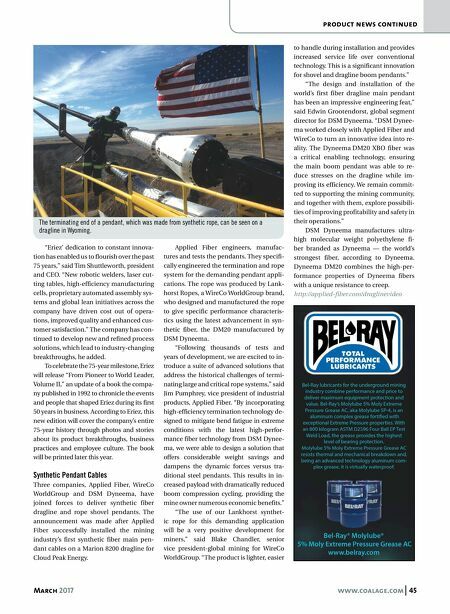 "As a result, the system delivers higher torque, faster acceleration, smoother retardation and lower operating costs." The system's slip/slide control feature acts like both an active traction control and an antilock brake system. It reduces tire slippage on acceleration and tire lock- up during braking. A pitch control feature reduces bouncing/rebounding on the truck as it hits bumps or uneven ground on the haul road. As the truck comes to a stop, the rebounding or rocking effect due to the change in inertia of the truck is also reduced. Hitachi's recently introduced five min- ing electric-powered hydraulic shovels to the U.S. and Latin American markets that feature an advanced electric-drive motor designed to provide a cost-effective solu- tion to mining operations where low-cost electric power is available. While Hitachi has been delivering electric-powered exca- vators to other parts of the world for many years in countries with a 50-hertz power supply, Hitachi engineers had to review U.S. and Latin American countries' specific safety regulations to ensure compliant op- erations in these countries with a 60-hertz power supply. The machines do not need costly consumables such as engine oil, fil- ters, coolant or fan belts. Components re- lated to an engine are also eliminated, such as radiators, air filters and mufflers. Hitachi next generation of mining ex- cavators, which will be released soon, will give customers the ability to choose what engine they want in their excavator. Next generation mining excavators in emis- sions-regulated countries like the U.S. and Canada will have a Final Tier 4 (FT4) en- gine choice of Cummins or MTU depend- ing on model. For countries outside of an emissions-regulated country, there will be a non-certified version of both. The new excavator will also include improved hydraulic system designs; ad- vanced electronic controls on the hydrau- lic pumps, improving response and eco- nomic control of the pump; and increased efficiency of the pump and system opera- tion, reducing fuel consumption and low- ering operating costs. Eriez Celebrates 75 Years This year marks 75 years in business for Eriez. From humble beginnings in 1942, the company has evolved into a world leader in separation technologies with manufac- turing facilities in Australia, Brazil, China, India, Japan, Mexico, South Africa and the U.K., as well as its Erie, Pennsylvania, head- quarters. Eriez has sales offices across the United States and some 80 international markets on five continents. Available in backhoe and front-shovel configurations, the EX5600-6 hydraulic excavator is now offered in diesel- and electric-powered configurations. It comes equipped with Hitachi's Global e-Service remote machine management system, which allows managers to access the machine remotely using the internet.